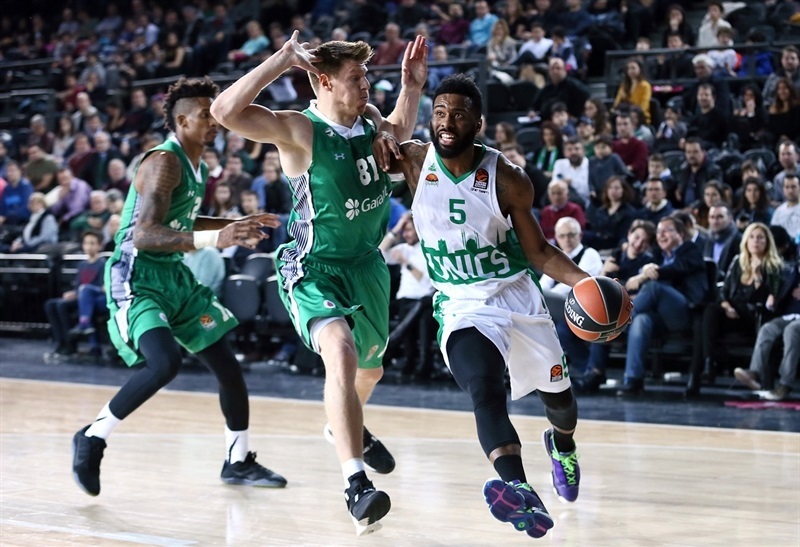 In a game of swings in the scoreboard, Darussafaka Dogus Istanbul had the last and most important run to see off visiting Unics Kazan 71-64 on Friday. 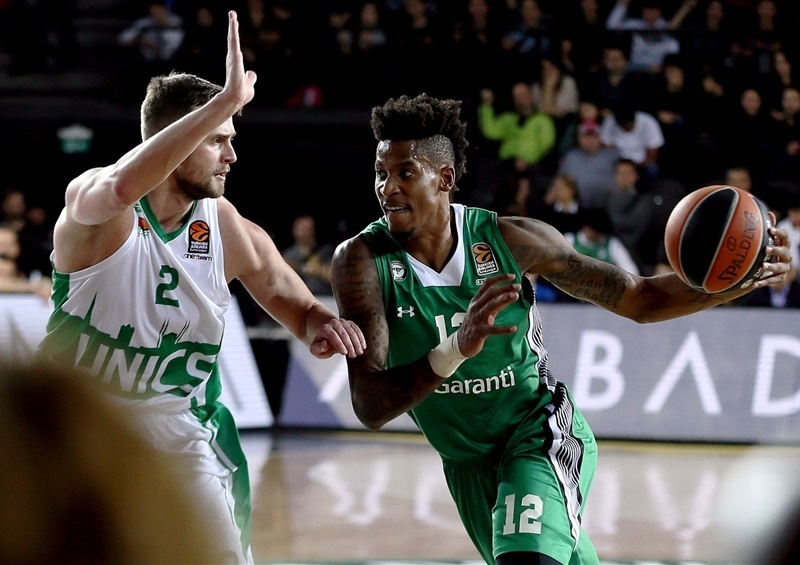 Darussafaka boosted its record to 10-8, the same as Panathinaikos Superfoods Athens and Crvena Zvezda mts Belgrade, good for eighth place. 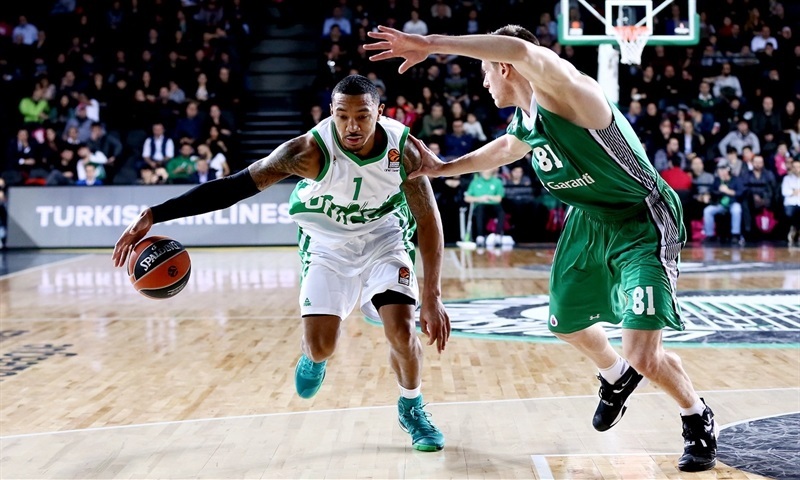 Unics fell to 7-11 alongside Brose Bamberg in 11th place. Darussafaka got 17 points and 7 rebounds forom Adrien Moerman. 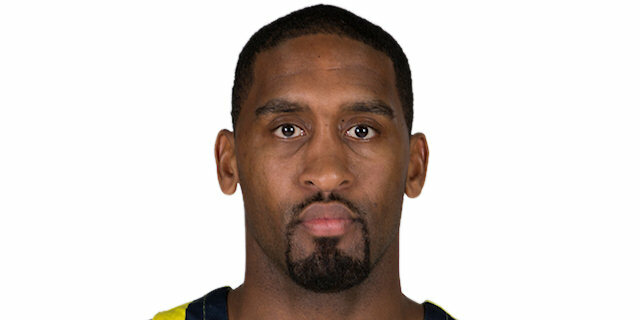 Brad Wanamaker followed with 16, 7 rebounds and 5 assists. Ante Zizic added 13 points and James Anderson 10 for the winners. 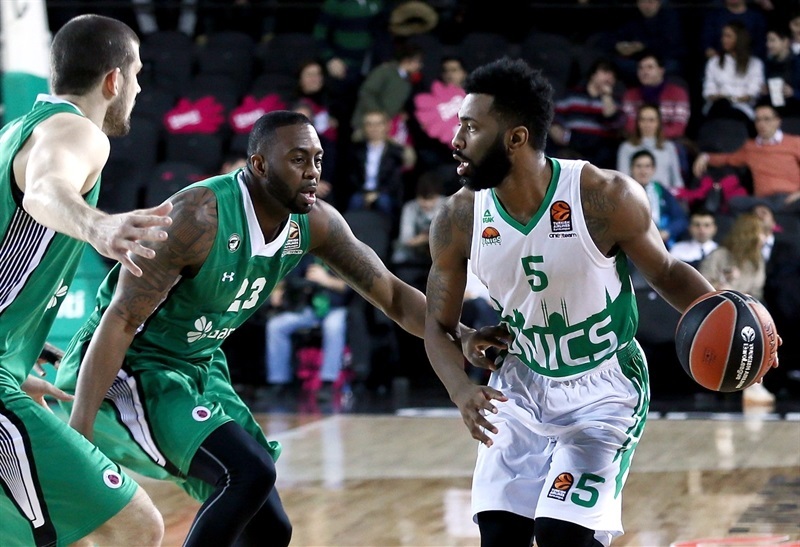 Unics got 16 points from Keith Langford, 13 each from Artsiom Parakhouski and Pavel Antipov and 10 from Orlando Johnson. 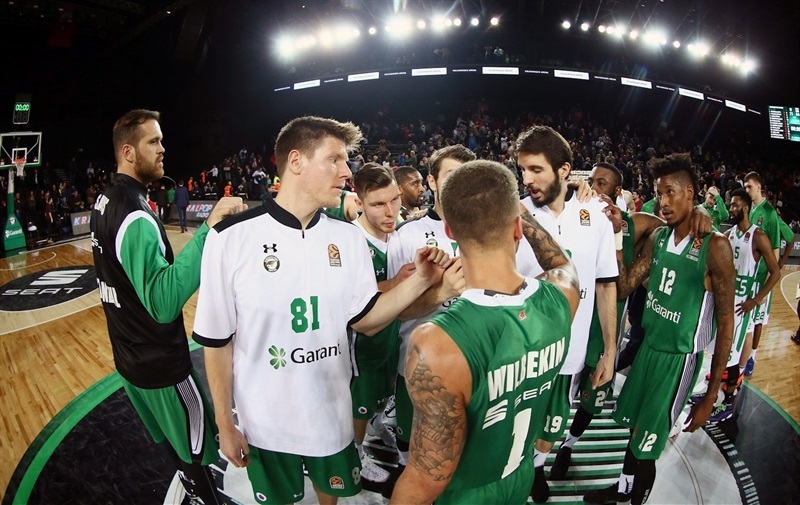 The visitors, down 15-7 early in the game, led both at halftime and the end of three quarters, but a 12-0 blast off led by Wanamaker, Moerman and Zizic was too much for the visitors as Darussafaka controlled the scoreboard to the finish. Moerman dunked a miss and hit a jumper around Langford's first triple to start the scoring. Parakhouski was strong inside before Zizic got loose for a dunk. Moerman continued scoring while Wanamaker and Anderson joined him for a 12-7 edge. Wanamaker and Wilbekin drilled their team's first triples around a nice alley-oop from Paul Stoll to Latavious Williams as the lead swelled to 23-11. 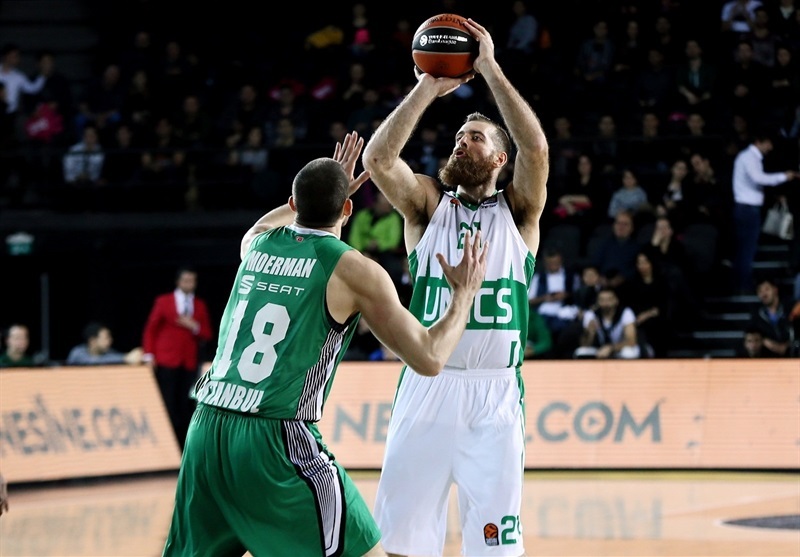 Langford's 4 of 6 free throws and Antipov's put-back helped Unics draw within 23-17 after 10 minutes. 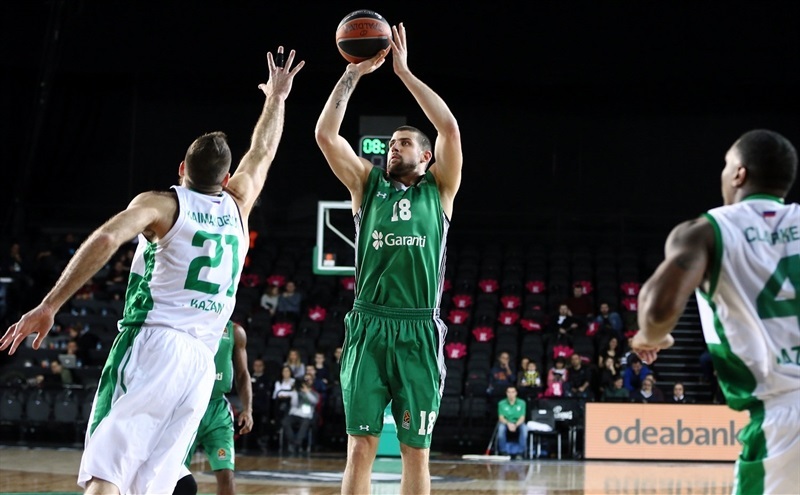 Moerman ended a four-minute scoring drought for Darussafaka, but Williams matched him with a put-back. Clyburn dropped free throws and slammed a fastbreak feed from Hanrangody at 28-20. But Unics, out of a timeout, got triples from Johnson and Antipov to trim the difference to 28-26. Wilbekin answered from deep and Coty Clarke scored for the guests before Antipov did the honors of taking the lead for Unics with 5 points in a row as the visitors reached halftime ahead 33-34. 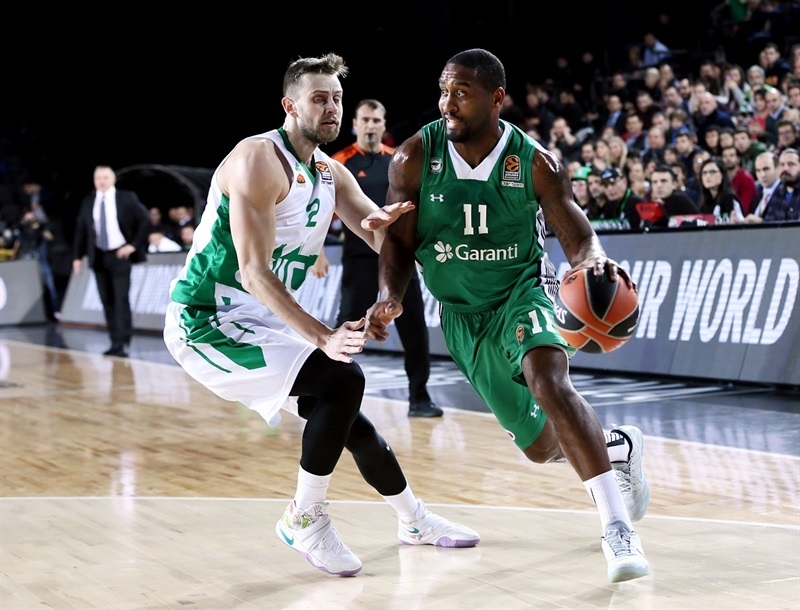 Moermann and Wanamaker took back the lead for Darussafaka right after the break. Wanamaker fed Zizic for a dunk before Stoll did the same to Parakhouski for Unics's first points after 3 minutes. Anderson's layup and tip-in fell but Darussafaka left Langford wide open for a triple at 41-39. 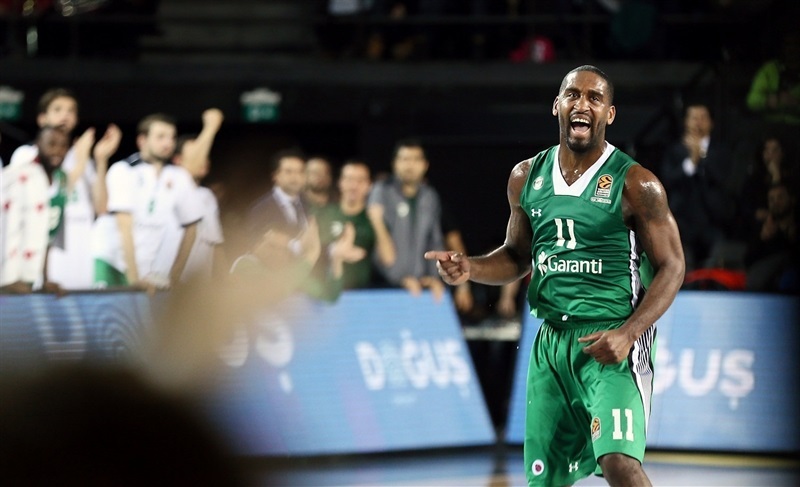 Clyburn emerged with baskets in close as the Darussafaka lead climbed to 47-39. Antipov's second-chance triple revived the visitors, and then Stoll's tied it up 47-47. Anderson's inside basket was matched by Langford, who came back with a triple for the game's 10th lead change. But Wanamaker went coast to coast for huge layup to end third quarter 51-52. 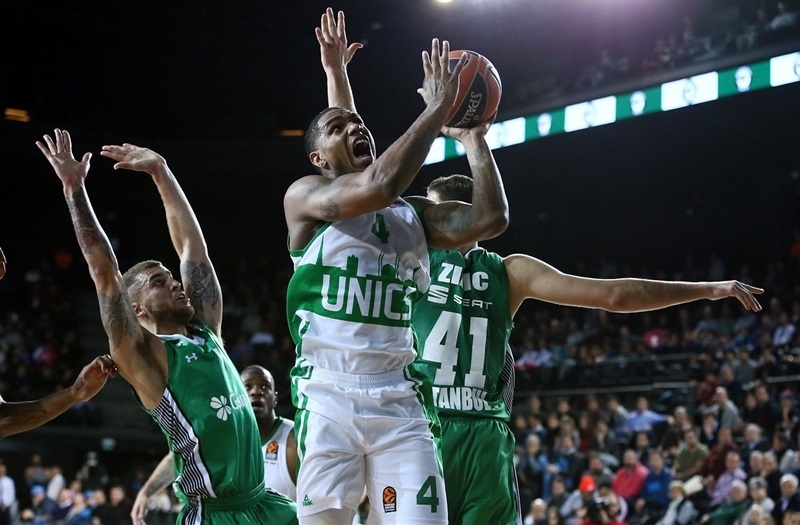 Williams put back a Unics miss to open the fourth quarter but Zizic matched him at the foul line. Wanamaker conjured a layup in traffic to re-take the lead and Dairis Bertans hit free throws to extend it to 57-54. Moerman's steal, layup and free throw was copied by Zizic on a nifty fake as the Darussafaka run reached 12-0 and its lead 63-54. 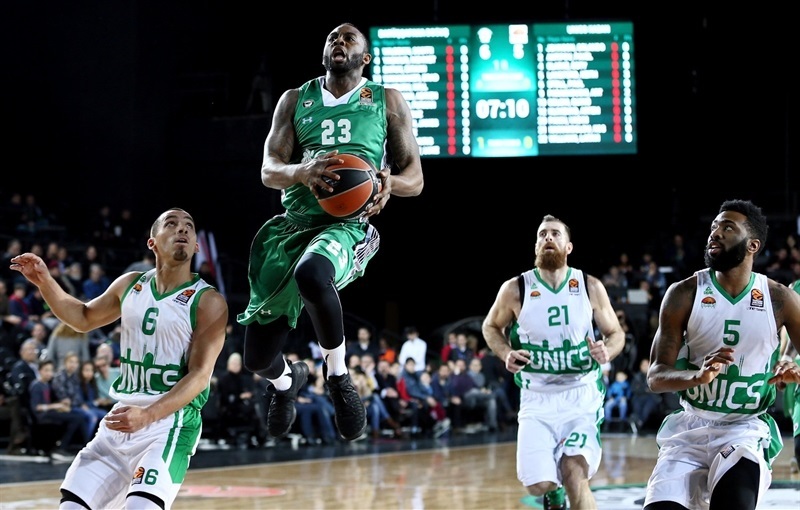 Clarke's free throw was the first point in 3:30 for Unics, but anyway Wilbekin fed Zizic to make it 67-57. 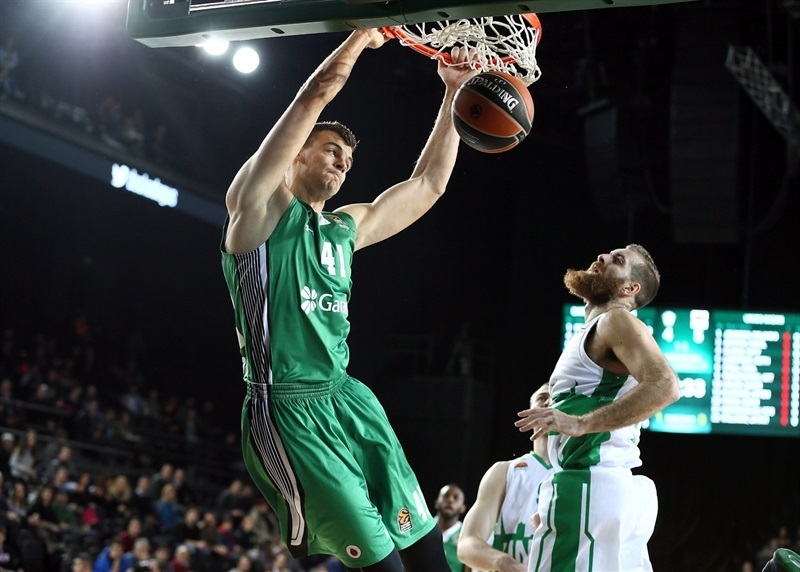 Johnson's tough layup for Unics was met by Bertans feeding Moerman for a reverse, and after Parakhouski's free throws, it was 69-62. Zizic and Parakhouski dropped second-chance baskets at 71-64 with 2 minutes left. A pair of close misses put Unics's back against the wall as the Darussafaka defense held up the rest of the way for much-deserved victory. 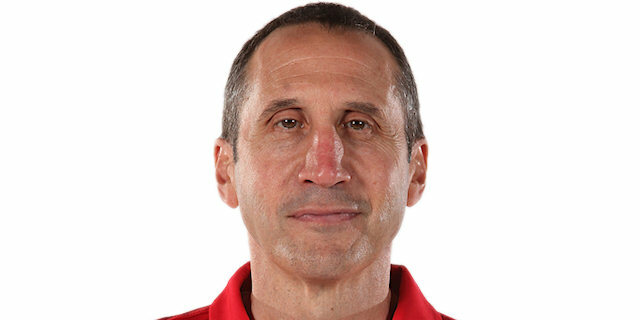 "Honestly, we didn't play well today with the exception of the fourth quarter and maybe the beginning of the game. I think the fact that we have not had a game for the last eight days caused us to lose a little bit of our rhythm. And Kazan is exactly the kind of team that, if you allow them to play their style, they slow you down and make you play a certain kind of basketball that we didn't want to play today. So credit to them, but credit to our guys that in the fourth quarter they realized the importance of the moment and they found a way to win. I'm going to take a look at the shots we got. I didn't think that all of them were good. I thought some were hurried. When we shoot threes in rhythm, even a lot, we're going to shoot a good percentage and it's going to mean a lot to our offense. Today, I didn't feel that we took the right kind of shots, and maybe that's the reason that we didn't score the ball." "From the beginning, we were planning to control the game in the first and second quarter, but we were not able to in the beginning because we played not-so-good defense. We found our energy in the second quarter and started to be much more aggressive and controlled the rebounds and defensively. And we contested their open shots with Anderson and Wanamaker and were able to take the lead. I think our mistake was when we started the third quarter slow and didn't react quickly. We let Darussafaka to take the lead again by seven or eight points, again with our bad defense, slow reaction and bad communication. We started playing unorganized offensively and Dogus raised the pressure and we had five or six possession without team offense. 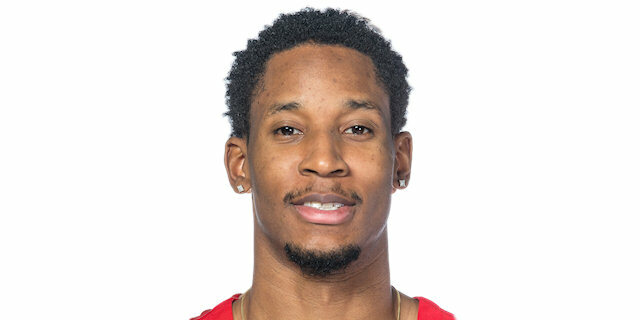 I think also key today were their 15 more rebounds and a lot of second chances today for Darussafaka." "It was definitely a good win for us. We didn't score great, but we did other things well. We defended well and that's how we won the game. Today I just tried to make things tough as possible for Keith (Langford). At the same time we did great help defense. I knew if he passed by me the next guy was coming. All our team effort was great on him today. Now we look forward to next game and to keep going like that." "At halftime we talked about it: we had to play our game. In the second quarter, we got out of our rhythm. We didn't play as we had at the start of the game. And once we did that, we got a nice little lead and won. They key is winning the game, but obviously in the future we won't win with 17 turnovers. So that's something we've got to do, get back to the drawing board, watch a little film and see where we can improve on that."